Once you’ve decided to buy a new printer, we’ll make sure it’s delivered on time and works the way you intended. That means we take over the complete installation of the new printing system. We work independently of manufacturers. That’s why we offer printers and printing systems from all major manufacturers including HP, OKI, Kyocera, Canon, Epson, Brother, Ricoh, Samsung, Lexmark, Xerox and Dell. 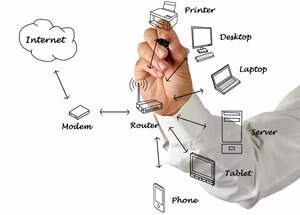 If necessary, we also support your IT when setting up or integrating the device as a network printer in the corporate network or when connecting to a mainframe computer system. Of course, we also integrate printers into popular PC and notebook operating systems, eg in Windows XP, Windows 7, Windows 8, Mac or Apple or Linux , connect them to your WLAN and show you how to use them from your smartphone and out can print. Your technical requirements will be coordinated with you in advance by our technical consultants. In terms of hardware configuration, manufacturers offer many options for their specific needs. These include, among others. We can either pre-configure the hardware with us and deliver the finished system to you, or we can carry out the configuration on-site. Depending on the scope and practicability we discuss and decide together with you. The correction of paper jams is theoretically taught. The relevant paper trays, flaps, levers and wheels are shown on the device and explain the troubleshooting information in the device display. For paper jams in the heating area, we explicitly point out the high temperatures in this area and the associated dangers. After successful completion, you will receive from us an installation protocol that summarizes all important information: transfer protocols, configuration pages, etc. Everything that is important later, we put together clearly and hand it over as electronic documentation. What we need from you is a contact person and information about the device, such as parking space, device model, serial number, MAC address, IP address and article number of the manufacturer. Access to the installation site should be ensured by elevators or goods lifts for printing systems weighing more than 30 kg. If this is not the case and the device has to be transported to the installation site via stairs, steps and other obstacles, we will gladly make you an offer for a cost-effective shipment. Depending on the device type, the use of one to four transport forces may be required. For the installations of several printing systems we gladly take over the complete rollout for you.